Explain where nuclear energy comes from. Describe the difference between fission and fusion. If we compare the mass of the reactant (235.0439) to the masses of the products (sum = 234.8605), we notice a mass difference of −0.1834 g, or −0.0001834 kg. Where did this mass go? (For the units to work out, mass must be expressed in units of kilograms.) That is, 16.5 billion kJ of energy is given off every time 1 mol of uranium-235 undergoes this nuclear reaction. This is an extraordinary amount of energy. Compare it to combustion reactions of hydrocarbons, which give off about 650 kJ/mol of energy for every CH2 unit in the hydrocarbon—on the order of hundreds of kilojoules per mole. Nuclear reactions give off billions of kilojoules per mole. Plutonium-239 can absorb a neutron and undergo a fission reaction to make an atom of gold-204 and an atom of phosphorus-31. Write the balanced nuclear equation for the process and determine the number of neutrons given off as part of the reaction. We predict that the overall process will give off five neutrons. Uranium-238 can absorb a neutron and undergo a fission reaction to produce an atom of cesium-135 and an atom of rubidium-96. Write the balanced nuclear equation for the process and determine the number of neutrons given off as part of the reaction. The molar mass in grams of each species is given for each particle. What is the energy change of this fission reaction? This is almost 6 trillion joules given off. A nuclear reactorAn apparatus designed to carefully control the progress of a nuclear reaction and extract the resulting energy for useful purposes. is an apparatus designed to carefully control the progress of a nuclear reaction and extract the resulting energy for useful purposes. 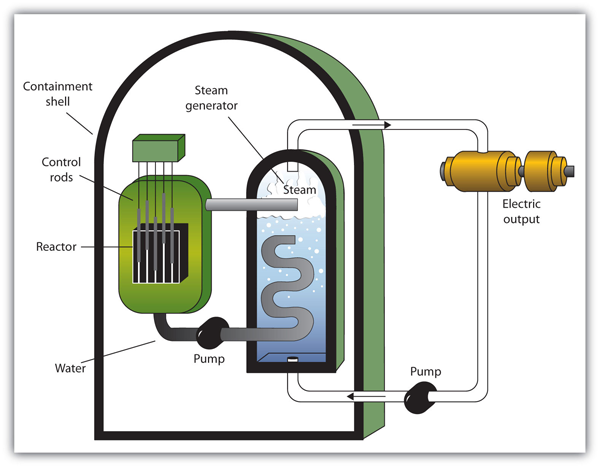 Figure 15.5 “A Diagram of a Nuclear Power Plant for Generating Electricity” shows a simplified diagram of a nuclear reactor. The energy from the controlled nuclear reaction converts water into high-pressure steam, which is used to run turbines that generate electricity. The two main components of the power plant are the nuclear reactor itself and the steam-driven turbine and electricity generator. Although fairly simple in theory, an atomic bomb is difficult to produce, in part because uranium-235, the isotope that undergoes fission, makes up only 0.7% of natural uranium; the rest is mostly uranium-238, which does not undergo fission. (Remember that the radioactive process that a nucleus undergoes is characteristic of the isotope.) To make uranium useful for nuclear reactors, the uranium in uranium-235 must be enriched to about 3%. The enrichment of uranium is a laborious and costly series of physical and chemical separations. To be useful in an atomic bomb, uranium must be enriched to 70% or more. At lesser concentrations, the chain reaction cannot sustain itself, so no explosion is produced. Notice that the amount of energy given off per mole of reactant is only one-tenth of the amount given off by the fission of 1 mol of uranium-235. On a mass (per gram) basis, however, hydrogen fusion gives off 10 times more energy than fission does. In addition, the product of fission is helium gas, not a wide range of isotopes (some of which are also radioactive) produced by fission. Fusion occurs in nature: The sun and other stars use fusion as their ultimate energy source. Fusion is also the basis of very destructive weapons that have been developed by several countries around the world. However, one current goal is to develop a source of controlled fusion for use as an energy source. The practical problem is that to perform fusion, extremely high pressures and temperatures are necessary. Currently, the only known stable systems undergoing fusion are the interiors of stars. The conditions necessary for fusion can be created using an atomic bomb, but the resulting fusion is uncontrollable (and the basis for another type of bomb, a hydrogen bomb). Currently, researchers are looking for safe, controlled ways for producing useful energy using fusion. Nuclear energy comes from tiny mass changes in nuclei as radioactive processes occur. In fission, large nuclei break apart and release energy; in fusion, small nuclei merge together and release energy. According to Einstein’s equation, the conversion of 1.00 g of matter into energy generates how much energy? How much matter needs to be converted to energy to supply 400 kJ of energy, the approximate energy of 1 mol of C–H bonds? What conclusion does this suggest about energy changes of chemical reactions? For every mole of lead-208 that decays, 0.1002 g of mass is lost. How much energy is given off per mole of lead-208 reacted? For every mole of radium-226 that decays, 0.1330 g of mass is lost. How much energy is given off per mole of radium-226 reacted? Recalculate the amount of energy from Exercise 3 in terms of the number of grams of lead-208 reacted. Recalculate the amount of energy from Exercise 4 in terms of the number of grams of radium-226 reacted. What is the energy change of this fission reaction? Masses in grams are provided. In the course of this reaction, 0.01888 g of mass is lost. How much energy is given off in the reaction of 1 mol of deuterium and tritium? If the reaction proceeds with 0.00781 g of mass lost on a molar basis, how much energy is given off? Briefly describe how a nuclear reactor generates electricity. Briefly describe the difference between how a nuclear reactor works and how a nuclear bomb works. Why must uranium be enriched to supply nuclear energy? A nuclear reactor controls a nuclear reaction to produce energy in usable amounts. The energy produced generates steam, which is used to turn a turbine that generates electricity for general use. Nuclear Energy by Jessie A. Key is licensed under a Creative Commons Attribution-NonCommercial-ShareAlike 4.0 International License, except where otherwise noted.